bike rack on a motorcycle - Chin on the Tank – Motorcycle stuff in Philadelphia. So… I’ve met Clint a few times. He’s a cool dude. Kills it riding trails. Even if you don’t like bmx… you’ll enjoy this vid. It’s mainly about Clint’s “living-free” lifestyle. He has an old Airstream trailer he lives out of and tows around the country with his veggie-diesel van. He travels for free due to getting/stealing used veggie oil from chinese food places. 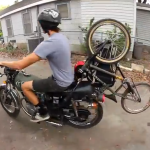 He has a cool cb350 with one of the best bmx bike racks I’ve seen. was good. Weather was awesome. I’ll let the pics speak for themselves.